Rococo Systems is a leading provider of Linn technology and Hi-Fi systems, and we understand that the sound quality and innovation is simply unbeatable. We want to assure you that a product purchased from Rococo Systems will never leave you behind with the times. Therefore, we offer the option of trading your current Linn sound system for part exchange of the newest models. 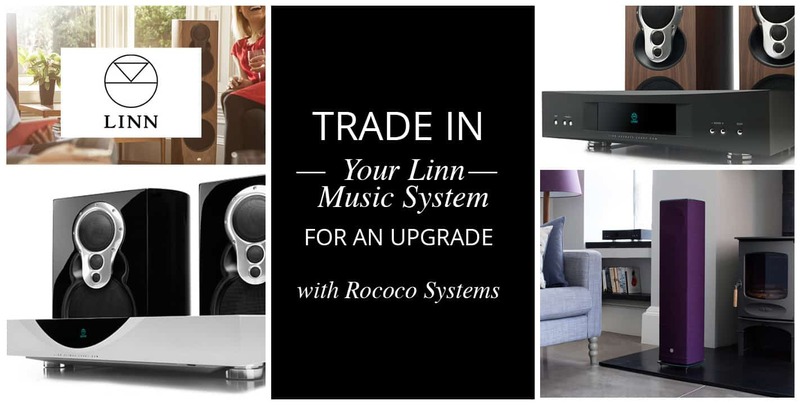 Rococo Systems & Design accepts a wide range of Linn products as a part-exchange to an upgrade of the latest technology. We accept all Linn speakers, amplifiers, DS players, Kontrols, CD players and turntables. Due to the quality and innovation of Linn products, they almost always keep a value and we are dedicated to helping you take advantage of this. You can bring your equipment into one of our offices, where our specialists will be able to value it for you. However, if you cannot make it to our London or Essex shops, you can also send your equipment to us via tracked mail or courier. We accept trade-ins from across the world. Rococo Systems and Designs also offers a repair service. Our experts use only Linn components to fix items, and we will never begin repairing until we have informed you of the full cost beforehand. If your warranty is still valid then all servicing and repair will be free of charge. If you have some products that could be traded in for a newer model, contact us to discover the latest in innovation from Linn. You can contact us online and we will get back to you as soon as possible. Alternatively, you can book an appointment at our London (020 7454 1234) or Essex (01277 890 888) office to speak to an expert directly.